Years ago I added the Richard Daniels instruction book “The Heavy Guitar Bible” to my already large collection. That isn’t the type of “heavy guitar” I’m writing about today. The question I’m interested in today is “How much do your guitars weigh?” A second question is how much does the weight matter? There is a lot of subjectivity regarding that. Guitar weight has an obvious relation to comfort if you play for hours, standing with a strap holding up your guitar. A heavy guitar could be mildly uncomfortable – or it could be a royal #*&! @# pain. I started thinking about guitar weight again when I wrote my previous blog (Summer 2013 News: Ibanez, Epiphone, Eastman …). The Eastman El Rey 14 inch hollow body jazz guitar was described as being very light-weight in the reviews for the guitar. One review found the weight to be just over 6 lbs. Besides comfort, guitar weight can affect the sound. It is one of those things where, “All other things being equal, …” you can make some reasonable predictions about sound from weight. But all things are never equal and so many things affect your guitars sound that any generalizations need to be regarded as “iffy” at best. Don’t worry, that won’t stop me. Heavier guitars tend to have better sustain (all other things being equal). In fact, it isn’t the overall weight as much as the density of the wood. Rosewood, ebony or ash are all dense woods and guitar necks and bodies made from them are likely to have more sustain than, say, mahogany. Although sustain is frequently something musicians strive to find in their instruments, it isn’t always good. Thus shredders and Flamenco guitarists prefer instruments made of lighter woods. These produce faster decays and allows better articulation of rapidly played notes. 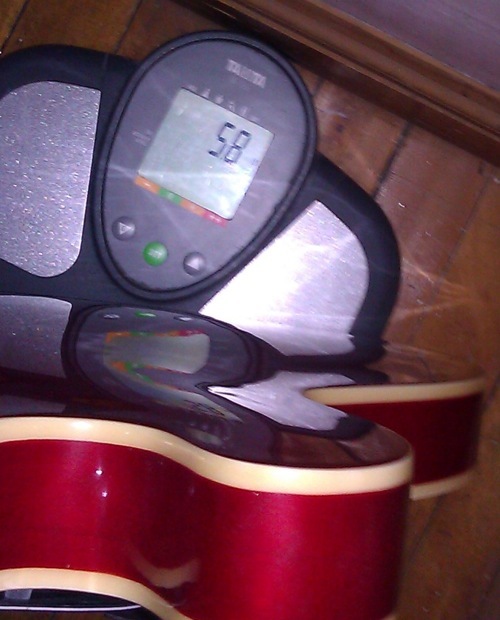 So how much do my electric guitars weigh? I took some measurements and here are the results. Weights are +/- 0.1 lbs. This scale rounds to 0.2 lbs. Scale was zeroed before each measurement (tared for you professionals) but has not been calibrated, so weights are approximate. The only real surprise was that the Danelectro weighed more than the Casino. The Dano is shaped like a Les Paul but with a semi-hollow body, pressboard top and back and plywood inside the body holding the parts and shaping the instrument. It’s a small guitar and seems lightweight. Well it is light, just not as light as the Casino. The difference in weights between my two Stratocasters also deserves a comment. Ash is supposed to be a denser wood than basswood. So how much of the weight difference is due to differences in body wood density? It’s difficult to know without disassembling the guitar and weighing the bodies and necks without hardware. The two guitars have different tuners, pickups, tailpiece, fret material and so on. It all adds up. The ash body probably weighs more than the basswood but the Schaller locking tuners on the American Deluxe also look heavier than the standard tuners on the 60s reissue. Overall this was an interesting experiment that satisfied my curiosity but the weights alone only predict relative comfort. You’ll have to do something else to really get a handle on sound, sustain and decay. Listen? Yeah, that’s it.